I live in Little Italy in downtown Toronto. While I was on the phone inside my office, I watched a Cooper's Hawk land on our pergola. 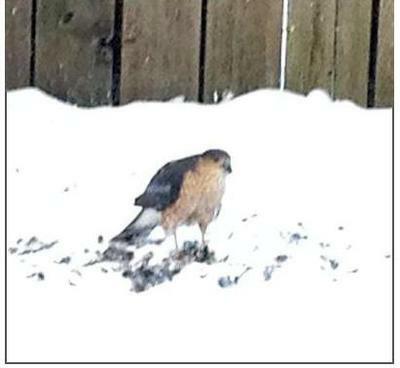 Since I have quite a few bird feeders in my backyard, I knew the hawk was likely hunting. Sure enough, after a minute or two of patient waiting, the hawk swooped down and grabbed a Slate Junco in his talons. 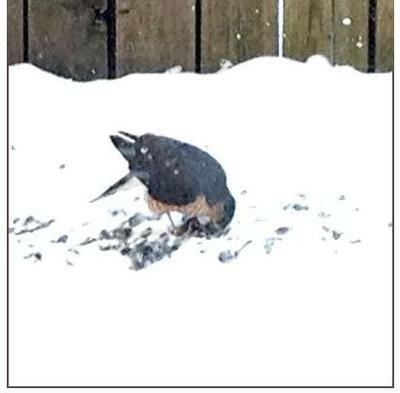 First, he pulled out the feathers and then had his meal. The two shots are taken from my cell phone and had to be enlarged so they're a little fuzzy. I feel privileged to have seen nature in action! Thank you for your report and pictures, I know our readers will enjoy them!